Tiger, S'miger. Got A Better Guy To Respect. 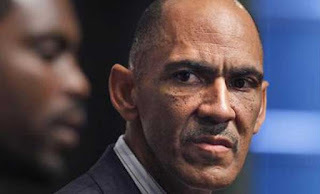 I got better guy that's earned my attention / respect - Tony Dungy. It's not the 'life coach' thing that 'wins the day', as admirable as all that IS. No, it's Tony's sense / consistency of Leadership, Integrity, and Approach that are the lessons for life.....and business. For Tiger? MY advice? Simple - a] Keep your 'driver' in your bag for God's sake [....save it for home-course play] and b] Call Tony to talk, listen, and learn. Seems to me TD's the better 'Great Black Hope' [Too crass? Ha. Just sayin' what you're all thinking when you look at these guys. ].